LONDON: 6 JUNE 2017 - The directors of ECR Minerals plc (the “Directors”) are pleased to announce that ECR has completed the subscription with Shenyang Xinliaoan Machinery Co Ltd (“Shenyang”) raising gross proceeds of £553,564 from the issue of 55,356,391 ordinary shares at a price of 1 pence per share. On admission of the subscription shares to trading on AIM (“Admission”), Shenyang will receive warrants over 83,034,586 new ordinary shares in total. Of these warrants, which are valid for five years, 55,356,391 warrants are exercisable at a price of 2 pence per share and 27,678,195 warrants have an exercise price of 5 pence per share. Shenyang will have a 22.4% shareholding in ECR (Following of the issue of Placing Shares as defined below). The shares will be subject to a 12-month lock-up. The subscription proceeds will be used for exploration at ECR’s existing gold projects, for evaluation of new opportunities, and for working capital. 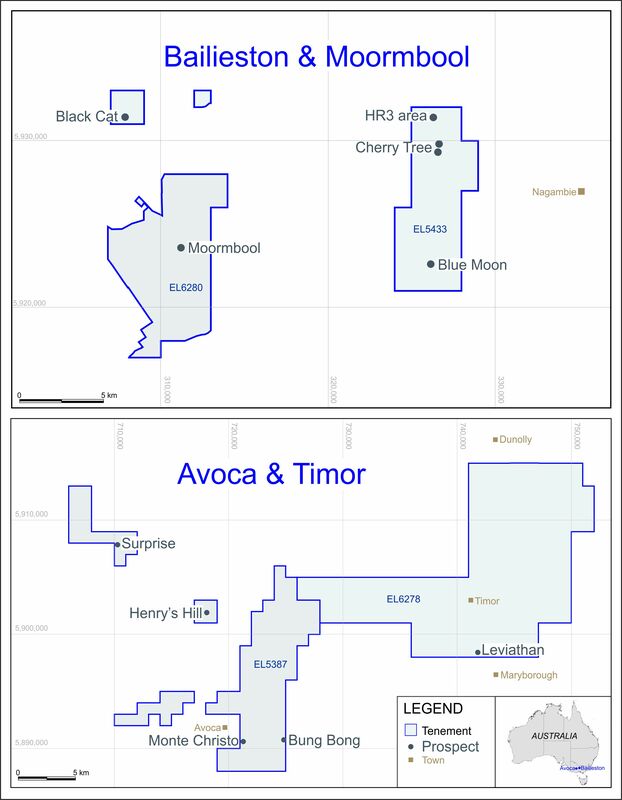 Drilling in the Byron area at ECR’s Bailieston gold project in Victoria, Australia is expected to commence in the coming weeks. “We see Shenyang as long-term, cornerstone investors in ECR, and the 12-month lock-up in place on the subscription shares indicates that Shenyang share this view. From this strong position, we look forward to developing ECR’s asset base and adding value for shareholders. Admission is expected to occur on or around 12 June 2017. Following Admission of the subscription shares, and the admission to trading on AIM on or around 16 June 2017 of placing shares pursuant to the Company’s announcement dated 2 June 2017 (“Placing Shares”), ECR’s issued ordinary share capital will comprise 247,605,240 ordinary shares of 0.001 pence. This number will represent the total voting rights in the Company, and, following admission of both the placing and subscription shares, may be used by shareholders as the denominator for the calculation by which they can determine if they are required to notify their interest in, or a change to their interest in, the Company under the Financial Conduct Authority's Disclosure and Transparency Rules. The new shares will rank pari passu in all respects with the ordinary shares of the Company currently traded on AIM. The Shenyang subscription shares will be subject to a lock-up for a period of 12 months following the date of Admission. The lock-up arrangements will be subject to standard carve outs in relation to, inter alia, transfer of the shares to a nominee account; and accepting (or making an irrevocable commitment in connection with) a general offer made to all shareholders under the City Code on Takeovers and Mergers. Pursuant to completion of the subscription, Shenyang is able to recommend up to two directors to be appointed to the board of the Company. ECR will make further announcements in due course as and when any board appointments are made. Shenyang will, from Admission, be granted certain pre-emption rights for so long as Shenyang holds more than 20% of the issued share capital of the Company. The Company, Shenyang and its connected parties and Cairn Financial Advisers LLP have entered into a relationship agreement, pursuant to which Shenyang, in its capacity as a substantial shareholder of ECR, has given various undertakings to the Company to ensure that the relationship and any arrangements between Shenyang, its associates and ECR remain on an arm’s length basis and are transacted on normal commercial terms. The relationship agreement will remain in force for so long as Shenyang holds a direct or indirect interest in at least 20% of the Company's issued ordinary share capital. Under Rule 9 of the Takeover Code, where any person acquires, whether by a single transaction or a series of transactions over a period of time, interests in securities which (taken together with securities in which he is already interested and in which persons acting in concert with him are interested) carry 30% or more of the voting rights of a company which is subject to the Takeover Code, that person is normally required by the Takeover Panel to make a general offer to all the remaining shareholders of that company to acquire their shares. A waiver of Rule 9 of the Takeover Code is not being sought in respect of the warrants to be issued to Shenyang. Therefore, shareholders should note that exercise of the warrants would be dependent on Shenyang’s percentage holding in the ordinary share capital of ECR reducing, or, Shenyang being required to make an offer for the Company’s entire issued share capital pursuant to Rule 9 of the Takeover Code.